Settles has led her team in scoring for the past two seasons. If there was any doubt coming into the season as to who was the most dangerous player on the field hockey team, one player in particular has certainly ended that argument. JAZMYNE ANDERSON TTN Bridget Settles protects the ball from a Michigan defender in the Owls’ 3-2 overtime loss last Saturday at Geasey Field. Settles has five of the team’s six goals this season. Senior forward and team captain Bridget Settles is off to an extremely fast start this season, and her stellar play could certainly bode well for the field hockey team and their Atlantic Ten Conference championship hopes. Through the first three games of the season, Settles has notched five of the team’s six goals. Settles has certainly done just that. She is coming off two consecutive seasons in which she led the team in goals with 12 and 13 in 2009 and 2010, respectively. Settles is certainly on pace to eclipse both of those totals in her final season with the Owls, and she may do so sooner rather than later. Being that this is her final year with the Owls, the role of team captain has been given to Settles. Settles seems to be having no issues adjusting to that title. Settles wasted no time this season displaying what she can bring on the field. In the Owls’ season opener against Bucknell, Settles celebrated her senior debut with a hat trick as the Owls defeated the Bison 4-0. Settles followed up her Bucknell performance by recording two goals against the nationally ranked Michigan on Saturday. Although the Owls eventually lost that game to Michigan in overtime, they showed their offensive prowess, and that they are capable of scoring goals against even the stingiest of defenses. Before the season started, Janney characterized Settles as one of the best forwards in the nation, and she hopes that it shows this season. If Settles continues to do the great things that her coach and teammates expect of her, it could go a long way toward the Owls reaching their goal of winning the A-10 championship, which seems to be the undoubted main focus of the team for this season. The vibe around the group seems to be that all of the pieces of a championship team are there and Settles looks to be the engine that is going to make this ship go. This progression has seemed all but inevitable for a few seasons now. Settles emerged her sophomore year and there were few who doubted that she would not continue to improve to the point where she would eventually be the leader of this team. Settles has won multiple A-10 Player of the Week awards, was named to the A-10 First Team last season and it seems like she is on pace to add a few more individual awards in her final season. However, her individual goals for the year do not hinge on her individual success. It seems like Settles will have little to worry about in regards to meeting her expectations on or off the field. She is already showing that she has come to play this season on the field and her leadership abilities away from the field are being praised by her coaches and teammates alike. The goal seems clear. Settles has already achieved so much in her time with the Owls and there is really only one more accomplishment of substance that she can look to add to the collection: an A-10 Conference Championship. The field hockey team defeated Richmond, 4-2, for the first time ever and advanced to the Atlantic Ten Tournament. 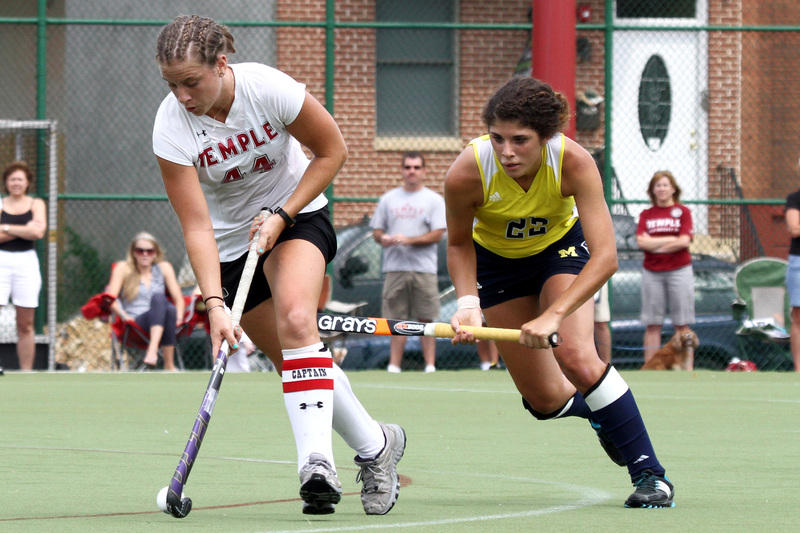 Field hockey should return to action at home Sunday.